L-R: MPs Allan Sewanyana, Medard Ssegona and Robert Kyagulanyi have vowed to disrupt the House if any of them is arrested. Photo by Vincent Kasozi. 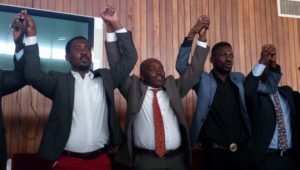 KAMPALA–The MPs who were summoned by the police to answer to charges of inciting violence have claimed to have uncovered a plot by police to have them arrested and humiliated publicly. Led by their lawyers, the MPs have warned today that if any of them is apprehended, no Parliament sitting will be able to proceed. Several MPs have been summoned by the police over the last week over accusation of inciting the public to riot against the proposed presidential age limit amendment. The MPs who received summons include Theodore Sekikubo ( Lwemiyaga County), Allan Ssewanyana (Makindye west), Robert Kyagulanyi (Kyadondo east) and Muhammed Nsereko (Kampala central). The Busiro East MP Medard Segona who also doubles as a legal advisor to the MPs in question told the press today that any attack on one MP is an attack on all legislators. “There will be no proceedings in Parliament with one of under persecution for their views,” he stated firmly. He accused the police of having been turned into a politically partisan force by some individuals. Ssegona revelaed that he and a few other MPs had escorted Ssekikubo to the CID headquarters in response to the summons but no senior officer related to the media crimes was available. He says they have resolved not to waste any valuable time responding to these summons. “We’ve advised our client the honourable Theodore Ssekikubo not to waste valuable parliamentary time going back to the police, but if they are interested they can visit him in his office at parliament,” he stated. Top city lawyer Caleb Olaka who has been retained to offer legal advice and assistance to the MPs noted that it is an abuse of office for the director of CID to waste his time of MPs who are mandated to hold views and debate on behalf of the electorate. He branded the summons as illegal saying they are meant to divert the MPs from doing their business. In a sign of direct defiance to the summons Robert Kyagulanyi who revealed he had been charged with inciting violence as a result of his message decided to repeat the same anti age limit amendment message today. He told the public that they had a right to reach out to their area MPs and hold them accountable. “You elected us to represent you but please do not leave this to us, it is your right to defend this constitution please go ahead and be peaceful but vigilant…. Stand up and be counted do not be silent because it is your right,” he asserted. Nsereko called upon individual police officers not be used to torture and persecute Ugandans, he singled out the degrading treatment that was meted out on the Lord Mayor Erias Lukwago and called on the police officer and the commander who led the operation to be brought to book. “To those men in uniform, do not take unlawful orders, I remember those that were used to beat up supporters of Dr. Kiiza Besigye you were arraigned alone” he warned. There is still an air of apprehension in the corridors of parliament as Speaker Rebecca Kadaga is tomorrow expected to rule on several notices of motions seeking amendments to the constitution. Kadaga’s ruling will determine the fate of a motion filed by Igara west MP Raphael Magyezi seeking leave of parliament to draft a bill intended to lift presidential the age limit of 75 years. The motion has divided the country and led to widespread protests against what is viewed as an attempt by president Museveni to cling to power beyond 75. Those opposed to the lifting of term limits are calling for the speaker to stick to her original ruling and reject any piece meal amendments while calling on government to present a comprehensive bill on reforms.